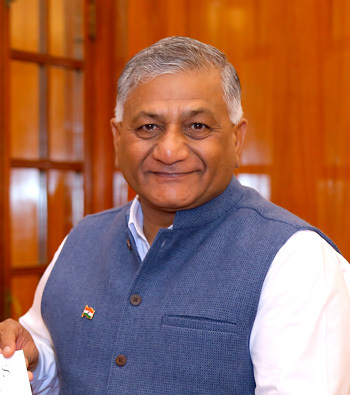 The visit by General VK Singh, MoS (EAM) to North Korea on May 15-16, 2018 was a surprise because in March 2018, India had imposed fresh restrictions on trade with North Korea, in line with the restrictions imposed by the UN. VK Singh held discussions with Vice President of Presidium of Supreme People's Assembly, Foreign Minister, Minister of Culture and the Vice Foreign Minister on a range of issues including developments on the Korean Peninsula, nuclear proliferation with particularly India�s concerns of nuclear proliferation in India�s neighborhood (read Pakistan) besides trade and commerce. He also reiterated India's support to the joint peace initiative by both Koreas, saying it both sides efforts for establishment of peace and prosperity on the Korean Peninsula were encouraging. From the North Korean side, assurances were given that as a friendly country, Pyongyang will never allow any action that would create concerns for India's security; though India has since long voiced its concern over North Korea-Pakistan missile and nuclear collaboration with Pakistan for valid reasons. VK Singh�s visit was in the backdrop of: impending Trump-Kim meet in Singapore; Trump�s warning to Kim to de-nuclearize or face fate like Libya, and; Kim cancelling the meet with South Korea. India responded to the invite by North Korea because of prospects of peace on the Korean Peninsula. India has diplomatic relations with North Korea since 1973, but this was the first high-level visit from India in two decades plus. India has been North Korea�s second biggest trade partner, after China. India�s export to North Korea was $76.52 million and import stood at $132.53 million in 2014-15 but bilateral trade between India and North Korea declined to $133.43 million in 2016-17 from $198.78 million in the previous fiscal. Yet, India declined indirect call by US to shut down its embassy in Pyongyang in 2017 on the argument that India�s diplomatic presence would be helpful to the US, in case Washington wanted to convey a message to North Korea. It is evident India wants to upgrade its bilateral relations with North Korea, in line with India�s Act East Policy (AEP) and so does North Korea with the country opening up. Among the multiple investment opportunities, is Kim Jong-un�s pet project � North Korea�s Rason SEZ established in 1992 where presently China, Russia and Mongolia have invested, but progress has been slow. During the Korean War, India supported UN resolution and military operations against North Korea but being neutral nation did not send military assistance to South Korea under UN Resolution 84. India was Chairman of the Neutral Nations Repatriation Commission. India has always been for Korean unification but has condemned nuclear tests by North Korea. In 2002, 2004 and 2010, India contributed 3,300 tons of food grains during famines in North Korea, directly and also under the UN World Food Program. In April 2015, North Korean Foreign Minister Ri Su Yong visited India and requested additional humanitarian assistance but no agreement was reached because of the North Korean statement in support of Pakistan. The Indo-US joint statement issued in June 2017, pledged to work together to counter North Korea�s weapons of mass destruction programs. However, India was part of the joint declaration of the BRICS Summit held at Xiamen in September 2017 that called for direct dialogue in the Korean Peninsula crisis. But the stumbling block in India-North Korea relations is North Korea�s nuclear and missile cooperation with Pakistan. In mid 1990s, intelligence reports indicated some 150 North Korean engineers engaged in making missile silos in Pakistan, including at forward air bases. In 1999, India impounded a North Korean ship carrying missile components and blueprints for Pakistan. In 2002, US reported Pakistan exported gas centrifuges to North Korea for produce nuclear bomb. But Musharraf convinced US this was handiwork of AQ Khan (nuclear scientist - �Father of the Bomb� in Pakistan) without knowledge of Pakistani Government. AQ Khan was not questioned by US, despite proliferating nuclear technology to North Korea, Iran, and Libya. Pakistani nuclear physicist, Pervez Hoodbhoy, interviewed by DW in September 2017, made following disclosures: Pakistan did transfer centrifuge technology to North Korea; it is possible this nuclear proliferation started shortly after Benazir Bhutto came to power in 1989 but ended in 2003 when AQ Khan was was caught transfering nuclear technology; A Q Khan could not have single-handedly transferred all technology from Pakistan to North Korea, Libya and Iran as it was a high-security installation in Pakistan guarded by police and military intelligence. Besides, centrifuge weighs half a ton each and couldn�t be smuggled out in a match box - certainly there was complicity at very high level, and; in return for the centrifuge that Pakistan supplied to North Korea, it received Dudong missiles, which were renamed "Ghouri" missiles. This proves Pakistani government was fully involved in nuclear-missile collaboration with North Korea. In 2011, Shirley Khan, Advisor to US Congress on Asian Security Affairs had observed that Pakistani army had provided North Korea with nuclear materials in exchange for $3 million bribe. In 2009, Shirley Khan had also noted: Pakistan�s nuclear proliferation to North Korea during late 1990s corresponded with increase in Chinese support to Pakistan�s nuclear program, and; by using Pakistan as a funnel for nuclear materials entering North Korea, China could strengthen the North Korea�s military capabilities without jeopardizing its intelligence sharing partnership with the US. Additionally, the book �The Nuclear Express: A Political History of the Bomb and its Proliferation�, by Thomas Reed, brought out that China under Deng Xiaoping, decided to proliferate nuclear technology to communists and radical Muslims in the third world based on the strategy that if the West started getting nuked by radical Muslim terrorists or another communist country without Chinese fingerprints, it would be good for China. No guesswork required that radical Muslim country was Pakistan and the communist regime North Korea. How and to what extent de-nuclearization of the Korean Peninsula will work out is yet to be seen. However, bonds of the China-Pakistan-North Korea troika will remain strong, given their past history. India will need to bear this in mind, while expanding its bilateral relationship with North Korea; this being imperative for strengthening India�s Act East Policy.